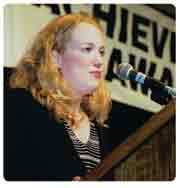 The 2001 NIKE Bursary recipient was Melanie Campbell of Ottawa. Melanie had one year left in the journalism course at Carleton University in Ottawa. Interested in both written and electronic journalism, Melanie, while still a student, had work published on the web – contributing an article to the Synchro Canada webiste. Melanie intended to look for a challenging opportunity in Canadian sports journalism after graduation and planned to seek an entry-level role in radio, TV, newspaper or magazine work.